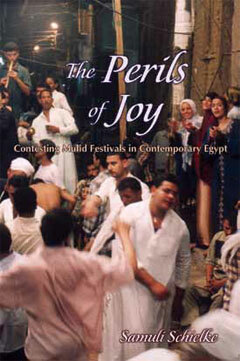 This October, Syracuse University Press will publish The Perils of Joy: Contesting Mulid Festivals in Contemporary Egypt by Samuli Schielke (Zentrum Moderner Orient research institute, Berlin). The publisher’s description follows. Mulids, festivals in honor of Muslim “friends of God,” have been part of Muslim religious and cultural life for close to a thousand years. While many Egyptians see mulids as an expression of joy and love for the Prophet Muhammad and his family, many others see them as opposed to Islam, a sign of a backward mentality, a piece of folklore at best. What is it about a mulid that makes it a threat to Islam and modernity in the eyes of some, and an indication of pious devotion in the eyes of others? What makes the celebration of a saint’s festival appear in such dramatically different contours? The Perils of Joy offers a rich investigation, both historical and ethnographic, of conflicting and transforming attitudes toward festivals in contemporary Egypt. Schielke argues that mulids are characterized by a utopian momentum of the extraordinary that troubles the grand schemes of order and perfection that have become hegemonic in Egypt since the twentieth century. Not an opposition between state and civil society, nor a division between Islamists and secularists, but rather the competition between different perceptions of what makes up a complete life forms the central line of conflict in the contestation of festive culture.